Available volumes 15 ml and 40 ml. Innovative preparation in a spray, dissolving and removing earwax. Preparation for adults and children over 3 months old. Earwax , otherwise known as cerumen, is a natural secretion of the ear glands. Excessive amount of earwax can cause unwanted effects, such as hearing impairment, discomfort, pain, cough. Hearing impairment occurs when accumulated earwax deposits block the ear canal limiting or preventing easy access of sound waves to the eardrum. Discomfort or pain may occur when excess earwax puts pressure on the eardrum. Coughing may occur if the earwax plug stimulates the nerves that are common to the ear canal and throat, causing the sensation of “tickling in the throat”. 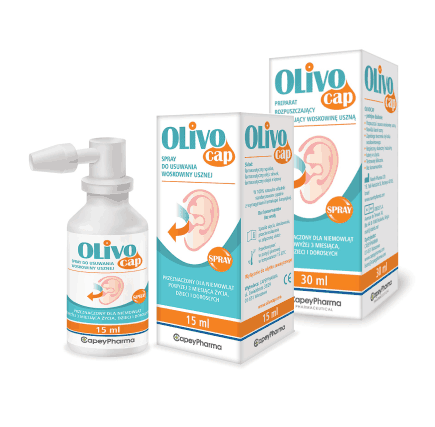 Olivocap® is a 100% natural spray for removing earwax, while additionally moisturizing the ear canal, preventing earwax to build up again, combining the features of a mechanical cleaning agent and the features of supporting the self-cleaning process of ears from earwax. helps prevent the formation of earwax plugs – supports the natural self-cleaning process of the ear from earwax. Olivocap® spray for removing earwax creates a protection barrier from water entering the ear. spray 1-2 doses into the ear from 3 to 5 times a day until the earwax is dissolved. spray 1-2 doses into each ear directly before swimming in a swimming pool or other water basin. The ear canal does not require washing after applying the preparation.